Went shopping today for B’s easter dress. First experience where what I like is NOT what she likes. Her taste is somewhat opposite of mine: flashy and princess-like. A pink fru-fru frock covered in iridescent sequins caught her eye and looked perfect while she twirled in the dressing room mirror. Yes, we had to twirl in each dress. I, of course, had selected a linen dress in pink and green that was very tailored and sweet. While standing in the dressing room, donning my choice of dress, she looks up and says “I like this one too, but I the pink one is the BEST!” In that moment, I was fully aware of her need to protect my feelings but still get the dress she wanted. This entry was posted in Uncategorized on March 14, 2009 by aliciachall28. Personally, I understand your dilemma completely after shopping with my 10 year old niece! I think it shows your desire to preserve her feelings by not trying to impose what you like on her. We’ve all had people do that to us and it is not fun. 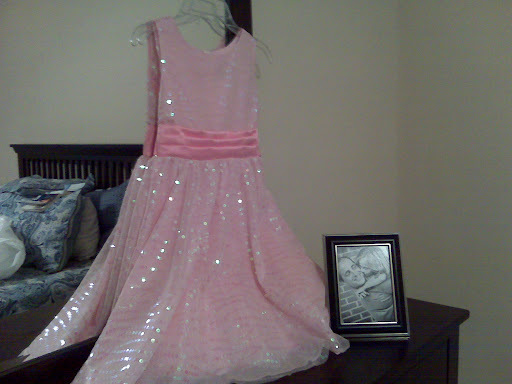 She will probably remember shopping with you for this dress for a long time…and think of it fondly! Good job!